The Lakers headed into their third home game in a row looking to get a win over the league leading Oklahoma City Thunder. 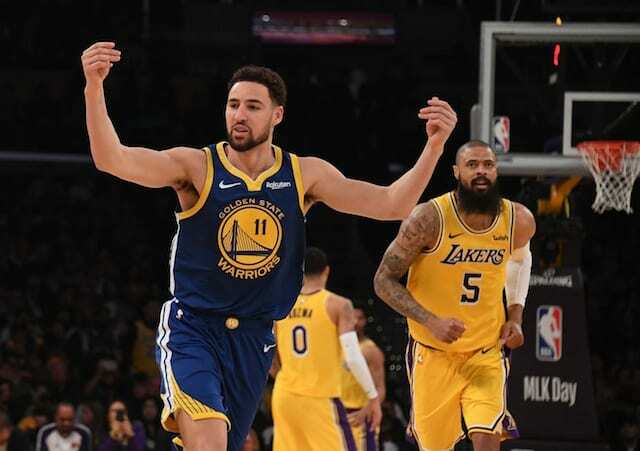 After two tough losses in a row to the Chicago Bulls and Utah Jazz earlier in the week, the Lakers were determined to head into the All Star Break with a victory. The purple and gold were without Steve Nash, who is still dealing with nerve root irritation and Pau Gasol with a right groin strain, among the many other injured players unable to suit up. The Lakers began the matchup with the fifth worst record in the NBA at 18-34. Kendall Marshall got the Lakers off to a good start, hitting a big three pointer for the first shot of the game and following it up with a layup to put the Lakers up early. Chris Kaman continued to shine playing good defense, grabbing rebounds and making a few buckets. However, the Lakers were unable to stop Kevin Durant who scored 10 of the Thunder’s 17 points combined with 6 rebounds. The Lakers went 4-9 from beyond the arc with two coming from Kendall Marshall who was the lead scorer with 10 points and three assists. The Lakers ended the first up on the Thunder, 24-17. Robert Sacre contributed to the Laker lead in the second quarter knocking down two shots right away. The Lakers defense stepped up putting pressure on the Thunder offense and forcing a few turn overs. Sacre stayed active in all aspects of the game, dishing it to Ryan Kelly who put it in despite heavy defense. The Lakers went on a 9-2 run to extend the lead to 10 with seven minutes left in the half. The Lakers were able to hold Durant to just 12 points in the first half. Kendall Marshall sent a few great passes over to Shawne Williams who hit back-to-back threes and a reverse layup. Marshall extended the lead to 9 with a fast and pretty layup. The Lakers were able to hold onto the lead shooting 53% from beyond the arc and ending the half with a 54-45 lead. The Thunder came out cold in the second half as Durant missed a three point shot followed by an air ball from Thabo Sefolosha. The Lakers offense continued to dominate as Steve Blake sent an alley-oop to Wes Johnson for a big slam. Chris Kaman hit back-to-back-to-back shots to push the Lakers up 66-53 with less than seven minutes left in the third quarter. Kaman shared the love with a dish it to Wes Johnson for a slam. Marshall felt confident with a fancy over the head pass to Jordan Hill for the hook shot followed by a deep throw to Wes Johnson who finished the fast break with a dunk. The Lakers have not given up the lead all night and at the end of the third quarter and are up 82-72. Ryan Kelly had been cold all night but knocked down a big three off a dime from Marshall and a blocked shot to start off the fourth. However, the Lakers allowed the Thunder to go on a 10-0 run and cut the lead to just three with just over nine minutes left in the game. Ex-Laker, Derek Fisher, hit a three with 6:30 min to go to tie the game at 87-87. Steve Blake hit a crucial jumper and was fouled for the three point play to put the Lakers up by one. With a nice spin move under the basket Chris Kaman put it in and was fouled. Kaman missed the free throw leaving the Lakers down 103-102 with 21 seconds remaining in the game. Kevin Durant scored 43 points in the game, with 19 coming in the fourth. The Lakers turned the ball over 9 times in the fourth and a total of 23 times in the game to allow the Thunder to take the lead. Kendall Marshall finished the game with 17 assists coupled with 14 points. Wes Johnson and Chris Kaman led the team with 19 points a piece. Despite the effort, the Lakers fell to the Oklahoma City Thunder, 107-103. **For all of our Lakers post-game videos, click here!